New Year, and more new tech for promoting your business and organization. Take a look at the new 360 Wifi Action Camera. A great give-away for any tech crowd, or even employee gifts. The 360 Wifi Action Camera comes equipped with a 1080P HD lense and a 0.96″ LCD screen to take your photography to the next level. Through an App you can stream live video from your connected device with the 360 camera. 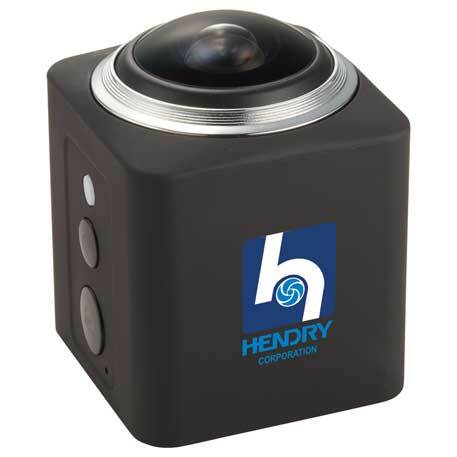 The 360 Camera is capable of taking both pictures & video with crystal clear resolution in full 360 panoramic view. The footage can be transferred wirelessly to your email, cloud storage, or social media account. Check out the video. Along with the HD camera you will receive additional accessories, which include a waterproof case, helmet mount, and a handlebar mount. The case is waterproof up to 30 meters. Micro USB charging cable included. SD Card not included. A 32 GB SD card is recommended. The 360 Wifi Action Camera can be printed with a full color logo. The imprint size is 1.25″ H x 1.00″ W.
Please contact us at info@proformagreen.com if you would like more information on – or samples of – the 360 Wifi Action Camera.